So good for lunch or dinner, this simple, delicious recipe uses oven-grilled corn cooks up perfectly every time and cooking corn this way also makes it super fast to peel of the husks when they’re cooked and that’s never a bad thing. right inside their husks. Trim any loose ends and outside leaves so nothing burns. The ears can go directly on to the oven rack. Fresh dill is an absolute must here. 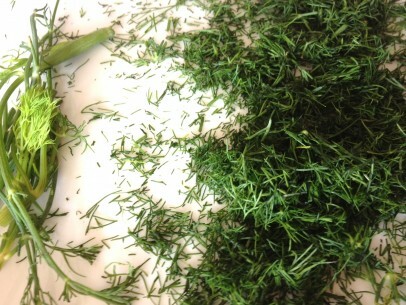 Chop the dill as finely as you can, no stems. I often use my kitchen scissors to get a nice result. It’s the perfect herb to complement the grilled corn flavor. Once the corn is cooked and cooled, peel of the husks and carefully slice the corn off the cob. Break up into single kernels. And please – don’t be tempted to substitute frozen or canned corn. It’s honestly not worth making unless you use fresh. 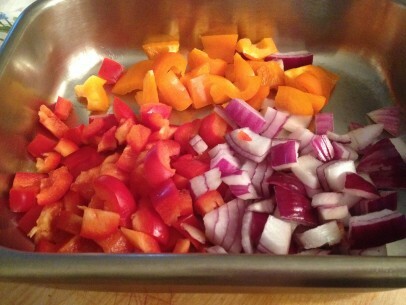 Use whichever colors of bell pepper you prefer. I like to use a combination of red, yellow and orange when I can because the colors just pop against the white/yellow corn. Red onion is nice here because the sweetness blends well with the other flavors. Cook the chopped peppers and onion in the oven at the same time as the corn. The vegetables will be cooked but not super soft, they’ll add to the textures of the salads. 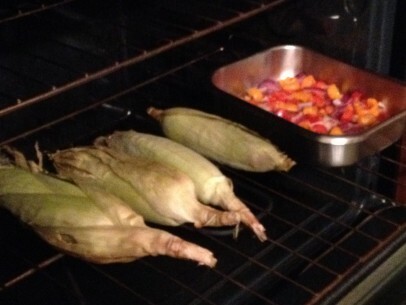 Roast corn and veggies in 350 degree oven for 30 minutes. Allow the corn to cool slightly before pulling of the husks. 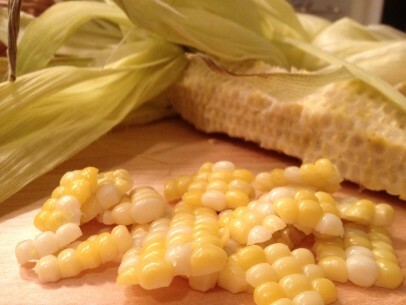 With a sharp knife, carefully cut kernels from the cob. 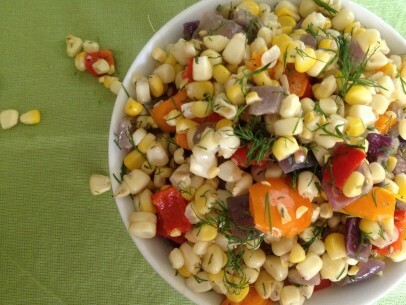 Break up the kernels and mix with chopped veggies and fresh dill. Add salt, pepper and olive oil. Combine well and serve. Tuck into a bowl of this salad with a piece of crusty bread or fill a pita pocket and you’ve got a quick and nutritious meal. Grilled corn salad keeps well in the refrigerator for 3-4 days but it never hangs around that long! This recipe makes about 5 cups of grilled corn salad and can easily be doubled, tripled or even quadrupled – I’ve made giant batches for barbecues and it always turns out perfectly. This is a great dish for parties too. 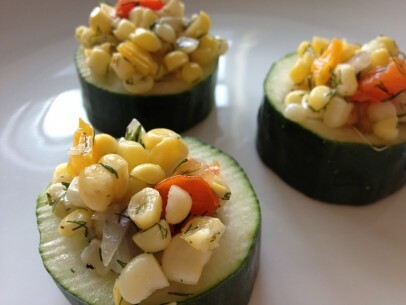 Serve in cucumber cups for a pretty, tasty bite sized appetizer.